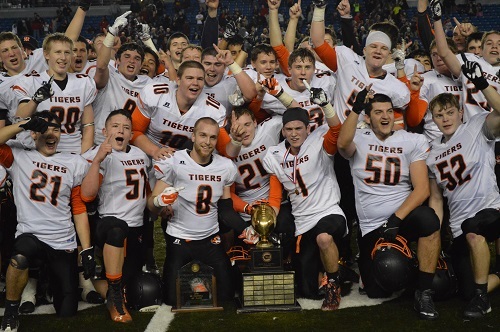 For the third straight year, the Napavine Tigers found themselves in the 2B Washington state championship game. Liberty (Spangle) wanted to play spoiler and end the Tigers quest for the illusive crown. The Liberty (Spangle) Lancers scored the first points with a short field goal, but Napavine answered with 14 unanswered and took a 14-10 lead into halftime. The Tigers kept the gas pedal on the floor and continued to pull away in the second half, scoring 13 more unanswered points in the 3rd quarter to take a 27-10 lead. The Lancers battled strong, but were unable to keep pace with the high octane Napavine offense. Lancers quarterback Garrett Rogers hooked up with Josh Larsen-Nowland late in the third to make it just an 11-point game going into the fourth. Quarterback Wyatt Stanley kept the clock moving for Napavine by capturing big runs and keeping the Lancer offense off the field in the fourth quarter. On the 40th anniversary of their 1976 title, Napavine answered the call and brought the state title back to town by winning the 2A Washington state crown. Liberty (Spangle) 16, Napavine 34.